Why did we start making these? A few days ago (as of April, 2003) I was thinking about prayer and posture -- how I should be praying more, and how having a place to kneel quietly in prayer might help. 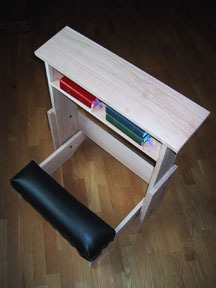 I looked up 'prayer kneeler' on some search engines to find a woodshop that was making a kit I could order and another company in the business of making personal prayer kneelers. To my amazement, the latter company's prices started at almost $800 ('half off of retail') and they had a 14-week delivery time. Despite the beauty of their kneelers, I couldn't see paying up to $1000 for this -- we just don't have that kind of money -- and didn't want to wait over three months, anyway. I kept looking and found a third little shop run by a nice retired gentleman. He had better prices, but such a backlog of orders that he was no longer even accepting new ones. 'Hmm,' I said to myself. Hmm, indeed. Having designed and made guitars and boats in my past, I figured this could not be too hard, and so set about making a design. A few hours later we had it designed and made. Prototype prior to trimming and finishing, legs in down position. I found our prototype's knee pad more comfortable than the ones at our local parish, and the top was at just the right height (and if it wasn't it would be easy enough to adjust). The top's angle was perfect for resting my arms, but also level enough that my prayer book did not slide off. Analysis aside, the 'bottom line' is that it has helped me to pray more frequently. We'd be honored to make a prayer kneeler for you or a loved one. The entire kneeler has a lifetime warranty against defects in materials or workmanship. The knee pad will wear in time, but can by inexpensively reupholstered by your local upholstery shop; we originally made some designs with removeable/replaceable knee pads, but have found them to be quite a bit more work and hassle than they are probably worth, given how easy it is to simply reupholster them. Any finish will wear with time and use, but the kneeler can be easily refinished, since it has nice straight lines. We use Watco Danish Oil finish, so if it is ever scratched or damaged it takes only a few minutes to touch up. Since making our first ones there have been many improvements to the design making it stronger, more stable and easier to use. Since starting with the prayer kneelers we've built an entire wood shop. In addition to the kneelers we now make many different benches and stools, chests and furniture (chairs, couches and small tables derived from mission-style designs).